Nerf Rival Artemis MXVI-3000 blaster, Red or Blue, pump action rapid-fire blasting with this triple tube Nerf Rival blaster that fires 30 high-impact rounds at a velocity up to 100 fps (30 mps). 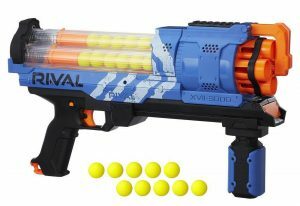 The Artemis MXVI-3000 comes with 30 rounds, has a trigger lock, tactical rail and easy-load system. Lighter and more compact than the Zeus & Chaos versions, a welcome addition to our NERF parties very soon.